Lately, it feels like every post popping up on the ’gram features the prettiest shade of pale green… but, nope, Pantone hasn’t changed its 2019 color of the year to “celery juice” (… yet). The buzzy wellness sip is still sweeping our Stories — and if you haven’t tried it yet, we know you’re at least thinking about stocking up on the stalks and pressing your own elixir. But when it comes to trying a trend, which questions should you ponder before pouncing on a new wellness routine? And how can you tell if your best efforts will even be effective? Whether you’re pondering CBD or skin fasting, here are five questions to ask before you hop on the latest trend to figure out whether it’s worth the time, sweat, and money — and, most importantly, if it actually aligns with your personal wellness goals. 1. Is this trend backed by scientific studies or an otherwise reputable resource? We know you know this, but it bears repeating: Just because a few hundred thousand people are doing something on Instagram doesn’t always mean it’s been vetted by hard science. Before diving deep into the uncharted territory that is (some forms of) alternative medicine, you have to do a little work. We live in the Instagram age, where it can be tricky to tell if the latest superfood craze is rooted in true nutrition or spawned as a marketing ploy to promote a book or push a product. A quick check-in with Google can help you uncover whether any credible sources have already done the work for you by reporting on this trend. If not, it’s up to you to do the digging (you can start by hitting up Google Scholar or Pubmed). For example, to date, there haven’t been any randomized controlled trials (the gold standard of scientific studies) on the benefits of drinking celery juice, and the self-proclaimed “originator” of the movement has zero medical training to back him up (just a “Spirit” who speaks to him in his right ear — seriously). That doesn’t necessarily mean it won’t work; it simply means that it has yet to be proven and the mechanisms of action are still up for debate. It’s important to note, however, that there are plenty of popular herbal medicines (e.g., reishi or rhodiola) without a ton of Western scientific research or reporting on them: The difference here is that these ingredients have a history of use spanning thousands of years, which lends them more credibility. 2. How will this fit into my current wellness routine? First things first: Does this trend *actually* make good sense? Does it require you to do something kinda crazy, like turn your entire apartment into a microgreens grow-house, plant and harvest your own turmeric, or drink nothing but radish-infused water for the next week? Be honest with yourself about how this change will mesh with your already super-busy lifestyle. If it’s going to take a ton of time and effort, you’ll have to weigh the long-term sustainability. Another big factor? Cost. Spendy supplements will quickly take a toll on your monthly budget, and it’s key to remember that they’re just that — supplemental. If you’re looking for a quick fix or a miracle cure, it’s probably going to be pricey, and, not to be boring, but you’ll most likely fare better by focusing your efforts on a steady diet of colorful veggies, high-fiber foods like lentils and oats, and lots of plain (not necessarily, ahem, rose-quartz infused) water. You should also make sure that any new process doesn’t take the place of something wellness-focused that you’re already doing — AKA no skipping your regular spin class in favor of doing a “detox cleanse” or popping a few CBD gummies instead of taking your prescribed anxiety medication. That’s where things can get dangerous. 3. What health benefits am I expecting? Starting a new routine shouldn’t be daunting or scary — in fact, small shifts can stack up to larger lifestyle changes. Think about the added value: Maybe getting up a little earlier each morning to try jade rolling, dry brushing, and oil pulling before your shower will naturally mean that you have to start hitting the hay before 10pm every night. Or maybe you’ve decided to try skin fasting next week, and this process of using literally nothing on your face for seven days might make you consider how your fave products impact your skin and rethink your daily regimen. These trickle-down effects from changing one aspect of your routine can — and should — be counted as a bigger wellness win. But pay attention to the grander picture too: your long-term health goals. Are you hoping to increase your physical fitness, battle brain fog, keep hormones in check, or reduce reliance on caffeine? Brainstorm how the piloted trend that’s caught your eye could help you accomplish those major ambitions. 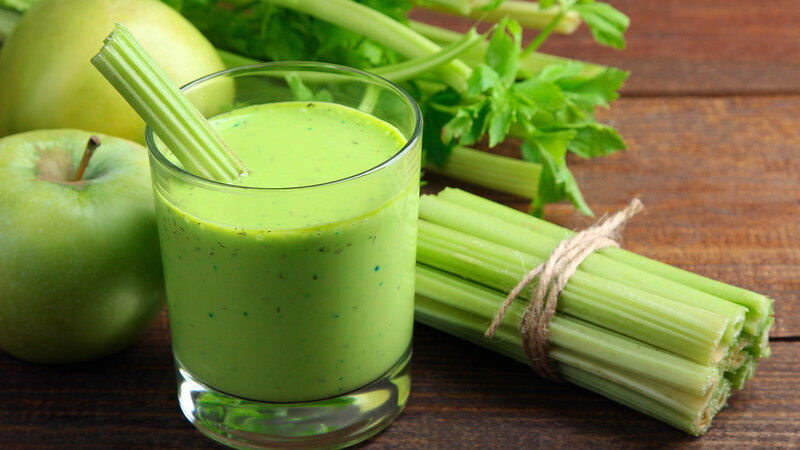 Starting each day with a glass of celery juice could help you make healthier choices as the day progresses, packing more keto-friendly snacks could boost your hormone-friendly fat intake, or switching your 3pm mocha to matcha could begin to gently ease you off the coffee train. 4. Can I commit to this for 30 days? Ask yourself if you can sustain the new behavior for a whole month. Alternative medicine therapies often work slowly, building up over weeks or even months of regular use (the exact opposite of many Western medicinal therapies, which are designed to function super-fast and are best employed in acute settings). In most cases, you should try to incorporate a new supplement or habit for at least 30 days for best results: CBD dropped into your cocktail might make you feel slightly more relaxed in the moment, but a tincture taken under the tongue each morning for a month will have a much more powerful overall effect on your brain and mood. 5. Are there any downsides? The thing about a wellness shift is that it should make your life better, not worse. But it’s so easy to get caught up in the buzz that we forget to do our due diligence. If you’re taking any type of prescription medication, be sure to cross-reference new supplements or superfoods with your prescribing doctor first. Certain ingredients (like activated charcoal, for one) can seriously inhibit medicine uptake, as well as general vitamin absorption — which means your meds’ effectiveness could be impacted. In other instances, jumping feet first into a new routine may have unintended consequences that no one’s really shouting out — like the way regularly drinking lemon water can start to erode the enamel on your pearly whites or downing undiluted apple cider vinegar can harm your esophageal lining if you do it often. And, while it’s starting to finally change, remember that supplements are still largely unregulated by the FDA. But all this doesn’t mean you can’t or shouldn’t try these things: You just might want to take them slowly. And if you decide that buzzy new trend isn’t aligned with where you are on your wellness journey? Well, you could always just drink more water. It’s literally the key to everything.